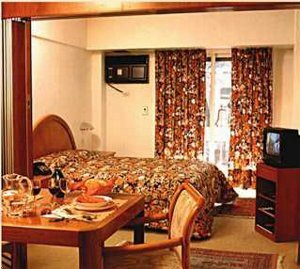 The Apart Recoleta is centrally located in the heart of the entertainment district of Buenos Aires, near the best restaurants, bars and antique shops and night life places. Enjoy our outdoor swimming pool, gymnasium as well as rooms furnished with your comfort in mind. Special features include kitchenettes and PC hook up facilities to meet all your needs for both the business and the leisure traveler during their stay. Superior Junior Suite-a 35 square meter room iwth a queen size bed, private bathroom with bathtub and shower, bidet, complimentary breakfast, complimentary newspaper, computer modem hookup, connecting rooms, hairdryer, mini bar-fee applies, non smoking rooms, in room safe, color cable TV, in room direct dial phone, kitchenette with Frigo-Bar, refrigerator, pots, pans plates and eating utensils. City views. Large Superior One Bedroom Suite with two connecting rooms, includes one queen size bed and a living room with sofas, two private bathrooms with bathtub and shower, bidet, air conditioning, balcony, complimentary breakfast and newspaper, computer modem hookup, connecting rooms, hairdryer, mini bar-fee applies, non smoking rooms, color cable TV, direct dial phone, kitchenette with Frigo-Bar, refrigerator, pots- pans- plates and eating utensils. City views. Deluxe Two Bedroom Suite. A large family suite with one queen bed and two twin beds, 2 connecting bedrooms, 2 private bathrooms with bathtub and shower, bidet, air conditioning, balcony, complimentary breakfast and newspaper, computer modem hookup, connecting rooms, hairdryer, mini bar-fee applies, non smoking rooms, in room safe, refrigerator, color cable TV, direct dial phone, kitchenette with Frigo-Bar, pots- pans- plates and eating utensils. City views. Large Superior Suite with one king bed, plus a living room, air conditioning, balcony, private bathrooms with bathtub and shower, bidet, complimentary breakfast and newspaper, computer modem hookup, hairdryer, mini bar-fee applies, non smoking rooms, color cable TV, direct dial phone, kitchenette with Frigo-Bar, refrigerator, pots- pans- plates and eating utensils. Take highway to city center, make a left turn in Entre Rios Avenue, follow thru via Calao Avenue until number 1800. Make a left turn on Quintana Avenue and take another left on Ayacucho Street, then take a right turn to reach the left side of hotel at Guido 1948.